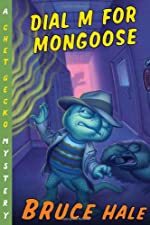 Review: Dial M for Mongoose is the greatest book ever and it was written by Bruce Hale! It combines a mixture of mystery and humor. Dial M for Mongoose is the 15th book in the Chet Gecko series. It's a real page-turner! Chet Gecko is a detective that investigates mysteries that nobody can figure out. One day while Mr. Zero was teaching there was this bad stench coming from the air vent. Mr. Zero thought somebody dropped a stink bomb. (And you know what I mean!!) Since the stench was so bad everybody had to evacuate the school. While Chet's class was evacuating he stayed in the school to wait for Natalie who is his partner in detecting. Once all the students were out of the building, they went into the building to investigate. They found out were the stench was coming from, the heating duct. When Chet and Natalie were in the building investigating and the building collapsed on top of them. Luckily they were able to get out safe. After the building collapsed they blamed Ms. Debree, the janitor for not having good structure on the building. They fired her and arrested her. When Ms. Debree was gone they had to interview Jerry Dooty to be the new janitor. He got the job. Chet and Natalie kept investigating and found a secret passage way underneath the cafeteria floor. Eggplant nose and Erik the spider planned the whole thing. That's where the stench came from. In my opinion, the book was very well written. The characters were very funny, and they were different animals. My favorite part was when Natalie sneezed and another building fell down. That was funny. I also liked when Chet ate lunch, and he ate a worm and dirt sundae. Overall I give this book 5 out of 5 stars because of the humor, the characters, and the clues that they give you. Review written by Brittani (5th grade student). We would like to thank Houghton Mifflin Harcourt for providing a copy of Dial M for Mongoose for this review. Have you read Dial M for Mongoose? How would you rate it?